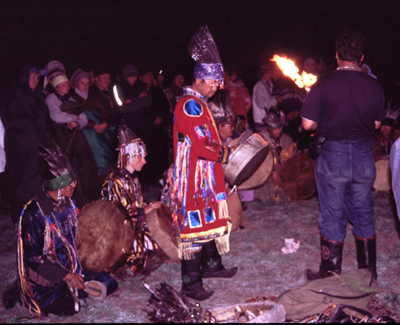 Night shamanic ceremony on the sacred Khaiyrakan (Bear) mountain which ended at dawn with the first sunrays opened the Second Shamanic Symposium in Tuva with over 60 practitioners and scientists from all over the world taking part in it. The delegation of Western shamans is headed by Roswitha and Paul Uccusic (Austria). Tuvan shamans from different shamanic societis are receving their colleagues. An international camp has been set up on the Khaiyrykan mountain. 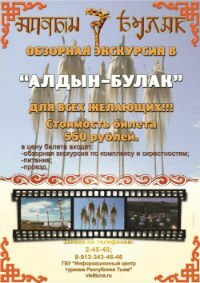 Today the cultural Festival 'Days of Saint-Peterbourg' has opened up in Kyzyl. They are sponsored by new senator of Tuva Ludmila Narusova, native of Leningrad. Within the program of the festival schientific conference on archaelogy, exhibitions and concerts of Saint-Petersbourg's stars. Moscovite Vyacheslav Ondar is awarded with the title "Merited Worker of Public Health Services of the Republic". Well-known Tuvan traumatologist Vyacheslav Ondar, who moved to Moscow ten years ago, was awarded with the title "Merited Worker of Public Health Services of the Republic". This is a late acknowledgement of his contribution to the health service development of Tuva, where he has worked without praise for twenty years. He is known as a doctor with 'golden hands'. An electric model of the river system of the Republic was created in the Tuvan Institute of Complex Natural Resources Development of the Siberian Branch of the Russian Academy of Sciences. The work was done by Tuvan scientists within the framework of the republican program Power Resources of the Republic of Tuva. The newly created system makes it possible to predict the development of various hydrological processes in various climatic situations.